Recently displaced Syrian children in a makeshift camp area, South West Idlib. Photo credit: Shafak/Save the Children. The escalation in fighting in southern Idlib has created one of the worst surges in displacement seen in Syria since the start of the conflict, Save the Children is warning. In the last few weeks, the fighting has forced around 200,000 people – some 54 percent of them children – to flee north as bombing and shelling has shut hundreds of schools and leveled homes and hospitals. Many are sheltering in the open in freezing temperatures or in abandoned buildings. With fighting closing in on all sides, many are trapped with nowhere left to flee. The grave situation is one of the largest movements of the almost seven-year conflict, with more than 7,000 people on average being displaced every day and four times more people being displaced than during the last phases of the Aleppo offensive. Save the Children partners are expecting tens of thousands more people to be forced north in the coming weeks with fighting likely to push deeper into Idlib. Civilian infrastructure continues to come under attack, with reports of seven schools and 12 health facilities hit by bombing or shelling in recent weeks. More than 500 schools – more than a third of all schools in Idlib – have had to close, including several supported by Save the Children. The mass movement is putting huge strain on already overstretched services. Idlib is already sheltering more than one million displaced people who have sought refuge or been moved there from other parts of Syria. Many fled there following the fight for Aleppo or other parts of Syria, while others have recently returned from neighboring Lebanon or Turkey but are now finding themselves back in the center of conflict. Long seen as an opposition stronghold, Idlib was declared a de-escalation zone last May in an agreement signed between the Syrian government, Iran, Turkey and Russia. However, fighting quickly escalated again and has now worsened further. “Our partners on the ground are saying that they regularly see multiple families now routinely taking refuge in one home. Many others have nowhere to shelter even as temperatures drop to freezing at night. Some families have been displaced over and over again. Worst of all, all these people are being pushed into an ever smaller and increasingly more overcrowded enclave with no real way out. There is not enough shelter, food, water or medicine and the infrastructure is being eroded away day by day. “We urgently need an end to the fighting and unfettered humanitarian access so that children can receive aid and schools can re-open,” Khush added. Save the Children’s rapid response team is working with local Syrian partner organizations Shafak, Violet and Syria Relief to distribute emergency kits to new arrivals – including plastic sheets for shelters, blankets, soap and solar lamps – as well as food rations and cash to help them buy essentials. However, the scale of need is far beyond current resources and funding is urgently needed to provide thousands more families with shelter and food. “People are coming day and night non-stop. 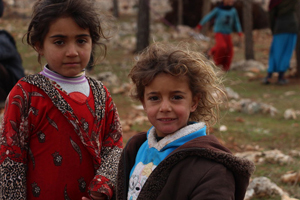 There are no places, shelters and tents left for them despite the cold, harsh weather,” said Najla, a teacher in Idlib. “I have five families in my house. They fled and sought refuge here. Can you imagine that people are fleeing bombing and shelling, and they have no tents and shelter?